In my last ramen post, I compared the merits of the two popular ramen joints in San Francisco and New York, but felt I was a bit unfair comparing a shio (soy-based) broth at Manhattan’s Ramen Setagaya to a miso broth at the Bay Area’s Santa Ramen. This past weekend I paid Visit No. 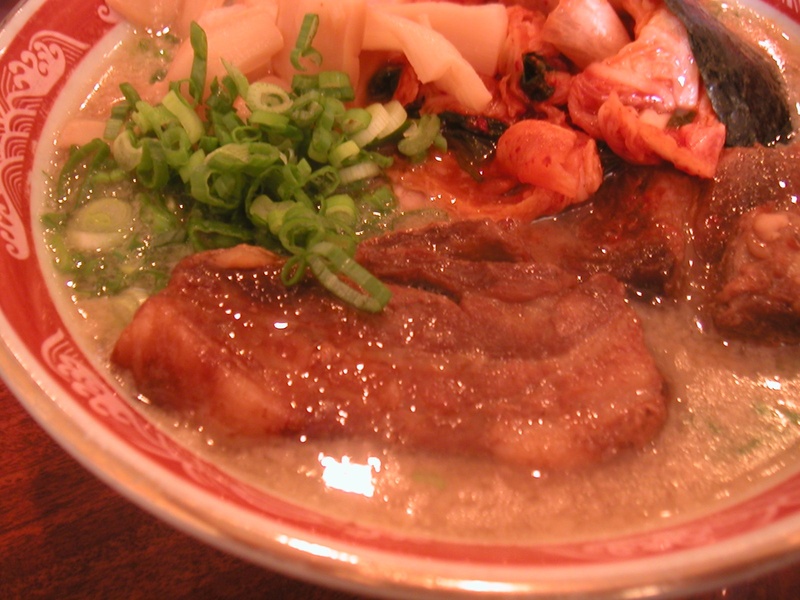 2 to San Mateo for just that reason: to try Santa Ramen’s shio broth. Following the advice from fellow ramen fiends, my friend Janice and I showed up to lunch at Santa Ramen at 11:30. There was already a line, and people who saw us headed there raced ahead to get a space in line before us. I ordered my ramen in shio broth, and stewed pork atop my ramen, an offering that is known to quickly run out. We both enjoyed the stewed pork — its gelatinous fat melted in the mouth instantaneously — but I wasn’t sure how it was any different from the traditional Chinese pork belly preparation, which imparts even more flavor. Santa’s shio broth was still much creamier than the one I’d tried at Ramen Setagaya, which also had a more complex flavor profile. Setagaya’s broth seemed lighter and more dimensional, possibly to the credit of its many ingredients such as dried seaweed and scallops. This entry was posted on May 11, 2008 at 8:58 am and is filed under Ramen, Restaurants with tags Ramen. You can follow any responses to this entry through the RSS 2.0 feed. You can leave a response, or trackback from your own site.